Launch Party: what a great time! Our launch party this past weekend was a great success — incredible people, amazing music, lots of food, and over $4,000 raised. It was a wonderful celebration of Malian culture and solidarity. Thanks to everyone who made it possible — and incredibly fun to boot! We’d like to give a shout out especially to our Host Committee (Matt Heberger, Michelle Chan, Marlow Schindler, Zach Matheson, Anh Ly, Adrienne Fitch-Frankel, Jenny McNulty, Joanna Breslin, Jayma Brown, Mark Randazzo, and Sarah Litke) for gathering such a fun and lively group; there were almost 100 people there. And we offer our deep gratitude to the Mathesons for sharing their beautiful home. I know a lot of us relished hanging out on the terrace and enjoying sweeping bay views on that gorgeous afternoon. Big thanks to JORM – Josh Austin, Oliver Mok, Rita Largman, Mat Lounibos for playing live jazz during the first half of the party. These folks are a relatively new band, but you’d never guess it. They sounded great! During the second half of the party, Roots of Manding — Karamo Susso, Gordon Helleger, Moussa Camara, and Ben Isaacs — transfixed and mesmerized people. And got some of us dancing. The libations were plenty good as well. Heartfelt appreciation to Joanna Breslin, for donating more than a case of very good wine; and to Fernando and Martha Amar, for providing delicious beer (their award-winning White House Honey Ale won third place in the SF Homebrewers Guild contest! ), tending the bar most of the afternoon, and generally making everyone feel welcome. Thanks also to Bintou Diarra, proprietor of African Hair Braiding in downtown Oakland for decorations, and for giving a rousing testimonial about the obstacles to health in villages in Mali (despite Matt’s admittedly mediocre translation — sorry!). We encourage Bay Area folks to check out her store at 1936 Broadway for your holiday shopping. 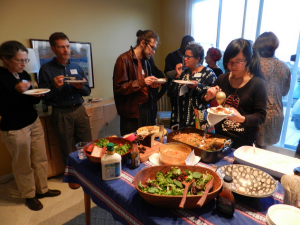 We also had some delish food in the house, thanks to the kind folks at Madecasse Chocolate, which donated delicious samples of their w orld-class chocolate, manufactured in Madagascar (four times the income impact of Fair Trade). Johnathan Bethony provided outstanding artisan loaves; see how beautiful they are, and check out his super project for a solar-powered bakery in Senegal. We can’t thank enough people, especially Host Committee members, for shopping, chopping, prepping, and cooking. 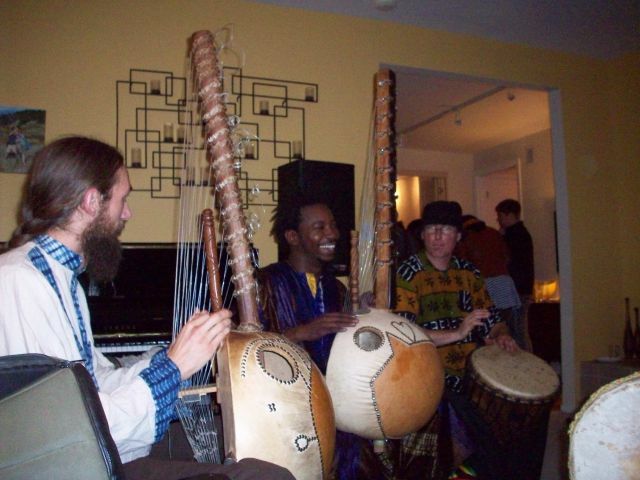 Also, thanks to Africa and Friends and World Music Meetup Groups, and Northern California Peace Corps Association, for their participation. Special thanks to Will Spargur for taking excellent photos, which can be viewed on flckr. Finally, i ni cɛ and i ni baaraji to African Sky, our fiscal sponsor, and its director Scott Lacy. Thanks to them, all donations to our project are tax-deductible. They are providing this service completely free of charge, and matching all donations to the Dokotoro Project by 20%. If you missed the fun, but still want to support the project, it’s not too late to make a donation!